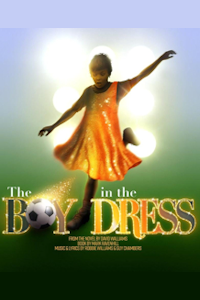 The Boy in the Dress tickets at Royal Shakespeare Theatre, Stratford-Upon-Avon. 2019-2020. Information for The Boy in the Dress at Royal Shakespeare Theatre, Stratford-Upon-Avon (Play). Dennis is 12 years old and his school football team's star striker. But when Mum leaves home, life is tough. The only reminder Dennis has of Mum is a photo of her in a beautiful yellow dress. A dress rather like the one on the cover of Vogue on sale at Raj's newsagents. And also a bit like the one that Lisa James, the coolest girl in the school, is sketching in her note book. What do you do if you like both football and dresses? And what will Mr Hawtrey the headteacher do when he discovers that his strict uniform code has been broken by a boy in a dress? Book by David Walliams. Adapted by Mark Ravenhill. Music Robbie Williams. Lyrics Robbie Williams. Music Guy Chambers. Lyrics Guy Chambers. Company Royal Shakespeare Company. Director Gregory Doran. Design Robert Jones. Choreographer Aletta Collins. Lighting Mark Henderson. Friday, 8th November 2019 to Sunday, 8th March 2020. Open 27th Nov 19.